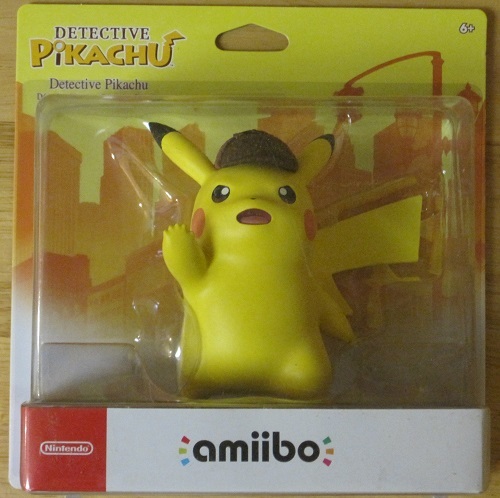 Detective Pikachu is on the case on the 3DS, and there is an amiibo figure to go with the game, too (sold separately). I managed to get both the game and the amiibo figure, though, so let’s take a look at them. Here is the Detective Pikachu amiibo figure inside the box. And here he is outside the box. I put him next to the regular Pikachu Smash Bros. amiibo so you could see how much bigger Detective Pikachu is! He’s nearly three times the size as the regular Pikachu! He’s Pika-Huge! He’s large and in charge! In other words, he’s a big boy. So the game basically plays like Phoenix Wright for kids. Similar in fashion to a point and click adventure game, you interview people and Pokemon to gather evidence and piece together clues on the touch screen. 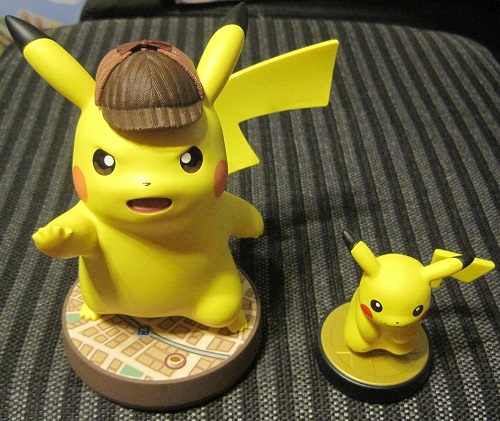 So what does the Detective Pikachu amiibo do? Well, in the game sometimes you can trigger events where you can talk to Pikachu and he’ll say something or do something silly. These events are called Pika-Prompts, and if you miss any in a chapter, you can scan the Detective Pikachu amiibo to view them all in previous chapters. The game is actually really good, and will rank high on my Game of the Year list probably. We’ll just have to see! darn that thing is gigantic.